If you listen to the media, there is a war going on. 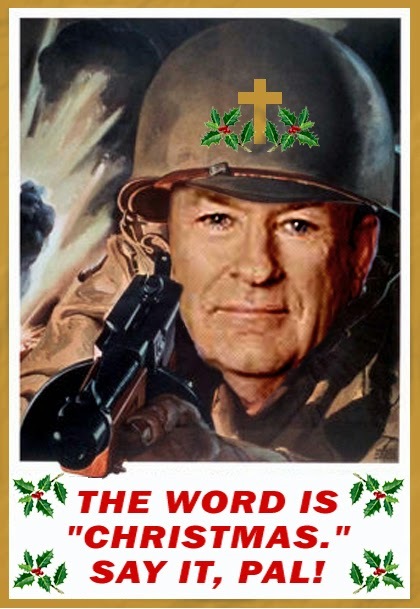 A war on Christmas. The Fundies are on one side, rocking bumper stickers telling us "Keep Christ in Christmas" and "No Christ No Christmas", making a big point of saying "Merry CHRISTmas" instead of "Happy Holidays", and reinforcing that Santa is white like Jesus so just deal with it. On the other side are fundamentalists of a different stripe, challenging public nativity scenes with Festivus poles and Flying Spaghetti Monster displays, running ads in Times Square that declare "Nobody...Needs Christ in Christmas", wishing people "Reasons Greetings", and reinforcing that Santa is fictional like Jesus so just deal with it. Is there a war on Christmas? Are American Christians being persecuted for celebrating Christmas? "War" is a rather strong word. Usually it means two sides are fighting about something that really matters. Like life. Or freedom. Or oil. Usually it means there are great losses. And casualties. Even deaths. There is no War on Christmas. There is debate. And conversation. And provocation. And - heavens to Betsy - MEDIA stirring up CONTROVERSY to get RATINGS! But there is no war. Christians and non-Christians alike are free to celebrate Christmas here in any way they chose, or not at all. And no, there is no persecution. No one in the United States can claim to be persecuted for being a Christian and celebrating Christmas. If you have a job and a home and a Christmas shopping budget and people to buy Christmas presents for, you have nothing to complain about. If you've lost your job, had your home burned, your children raped, and/or your head severed for your beliefs, then you have a case. But if people reply to your "Merry CHRISTMAS and have a BLESSED day!" with a sneer, mock your decorations/bumper sticker/sweater, or avoid conversations with you in the break room, you are not persecuted. You are just annoying. I love Christmas, I do. I start listening to Christmas music before Thanksgiving. I enjoy shopping for my family. I like decorations and seeing the Christmas lights. I adore hymns and sermons, choirs and creches. I love being with my family. I also happen to love Jesus. But I have to confess, I'm not sure my idea of Christmas has a whole lot to do with Him. If I'm truly honest, to me Christmas is a feeling. It's watching shows like "It's a Wonderful Life" and "Miracle on 34th Street" and "A Charlie Brown's Christmas"...that were created by Hollywood. It's listening to Christmas music...much of which was written by or sung by Jews and nonbelievers (and, thankfully, non-Beliebers). It's decorating a Christmas tree (pagan), kissing under mistletoe (pagan), and hanging wreaths (pagan). It's putting up my Nativity creche with my manger and my white Baby Jesus, along with sheep, donkeys, shepherds, wise men and angels all together at once (historically inaccurate). It's seeing smiling images of Santa Claus...a fictional character based on a Greek bishop from Turkey (potentially not very white), adopted by the Germans as a replacement for Odin (pagan), imported to the US by the Dutch ("you ain't much if you ain't..."), and sanitized by Coca-Cola (evil GMO promoters). It's a remembrance of the birth of Jesus of course (a Middle Eastern Jew, decidedly not white). But it's also memories of Christmases gone by with family and friends. Christmas would be nothing to me without family. Some say Christmas is all about the family, and that's the way Jesus intended it to be. Might want to explain that to Mary and Joseph, who were pressed by the government to travel a week away from their family to Bethlehem, where they gave birth to a son in thankless conditions, received odd visitors including poor farmers and a bunch of pagan astrologists, and then had to move to Egypt, leaving behind thousands of families whose baby boys were then murdered. I'm starting to think the atheists could be right about one thing. Maybe nobody does need Christ in Christmas. If there was no historic Jesus, Christmas in our society would keep going on year after year. Because very little of what we do at Christmas time has anything to do with Jesus. Which is why fewer and fewer people give a rat's behind what Christians think. Or believe. For those of us who love Jesus and love Christmas, maybe it's time to be honest with ourselves and stop being so obnoxious to others who do not see Christmas the same way or celebrate it at all. Stop cramming Baby Jesus down people's throats. Stop saying "Merry CHRISTMAS" with an accusatory tone. Stop making December 25th a National Day of Being With Your Family Or Else. If you're serious about Jesus, go to church more frequently than the mall. Donate to someone less fortunate, or better yet, do for them yourself. Give up the cushy parking space and walk for a change. Be nice, especially to jerks. Pray more. Listen to people instead of talking with an agenda. Because maybe, just maybe, they will be so amazed that they will ask how you can be so calm, so joyful, so peaceful in the midst of the holiday rush. And then, like Linus, you can share the REAL story of what Christmas is about for you. And take the wind right out of the sails (and the sales) of the media machine. I could be wrong, but something tells me that would make Jesus a happy camper.